For more than 20 years, Sam Ramji has been a bright light in the Seattle and Silicon Valley technology scenes, working at the epicenters of the open source and cloud computing revolutions. Currently CEO of the Cloud Foundry Foundation, Sam previously served as chief strategy officer for API management outfit Apigee, designed and led Microsoft’s open source strategy, and drove product strategy for BEA WebLogic Integration. Now as the newest member of Teradici’s board of directors, Sam’s insight and experience will be invaluable in assisting our executive team as they further our mission of using PCoIP technology to fulfill the promise of the cloud across multiple devices and environments. 1. What inspired you to get involved with Teradici? I joined Teradici’s board because the technology they have built with PCoIP can revolutionize how we connect screens to the internet. There are hundreds of millions of new people and devices connected to the internet every year and that pace keeps increasing. What we haven’t figured out as an industry is how to make it easy to apply the power of the cloud to all of those screens. PCoIP lets you put your clients in the cloud, quite literally: your PC or Linux desktop machine sits in the cloud and all of your control and video and images come down to your local screen as if the client were in your hands or under your desk. 2. What is your favorite part about your current job and your role on the Teradici board? It’s been a blast getting into strategy discussions with the Teradici executive team and the board, with legends and mentors like Don Listwin (get to know Don here) and Dan Rubin. There’s a big shift in the technology industry right now – value that used to be in hardware is now moving to software and I’m interested in helping navigate this change for Teradici. We went through a similar shift at Apigee (APIC) in 2009-2010 – from a high-performance hardware appliance for application protocols (APIs) to a high-scale cloud software platform for APIs. 3. The Teradici Pervasive Computing Platform is all about making cloud solutions that were previously impossible, possible. Was there a moment in your career where you thought something was impossible that you made possible? Software should always be about turning impossibility into possibility. At my first startup, NetStudio, we put professional web graphics in the hands of everyday users. This was back in 1998 when you had to build pages by hand, and graphics were either done by professional artists or else the site looked amateurish. We won “Best of Show” at Internet World in Spring ‘98 by embedding expertise and aesthetics into a consumer application. It took both imagination (“what would it mean to put a professional artist into the software?”) and technology (“how can we take C++ and Windows and make this fast on current consumer hardware?”). It’s tough to run intelligence on a 486 or a Pentium! 4. If you could give your 25 year old self one piece of advice, what would it be? Pay attention to the people you meet and stay connected; it’s a small industry and gets smaller over time. Stay connected to older people you respect, even if you don’t feel worthy of their attention. People really do want to help you succeed. Many of us who come into technology are natural introverts, and while the ability to be quiet and think is very helpful in a tech career, building some basic habits like keeping a list of people you email once or twice a year will pay large dividends. 5. What do you envision for the future of cloud? “It’s difficult to make predictions, especially about the future.” Surprisingly, that’s not a Yogi Berra quote but from Niels Bohr, the quantum physicist and Nobel Prize winner. It makes sense to start by “predicting the past” – what are the interesting, surprising or inevitable trends? 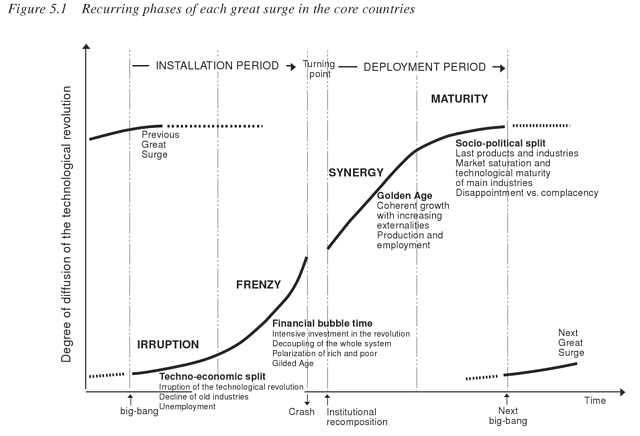 The back half of the curve in all prior revolutions was marked by ubiquity of the key technology: it became cheap and globally deployed. Now we see open source and cloud computing as the way information technology becomes ubiquitous. Perhaps more significantly, businesses in many industries are saying a new mantra: “every company must become a software company,” including titans like GE. If this is the inevitable trend then we will see movement to cloud computing, coupled with adoption of open source, on a scale that we’ve yet to imagine. The most likely interesting outcome that I see in the coming years is the “industrialization” of the cloud. Currently we think of the cloud as a horizontal thing, offering compute, storage, and networking as a utility. It’s an awful lot of work to turn those three low-level things into industrial value: to sell a movie ticket, measure factory efficiency, or predict the uptime of an aircraft engine. The companies that are able to make business value as easy to get as an Amazon EC2 instance will be long-term winners of the next phase of the cloud. 6. Which technology trend or industry do you see the cloud having the biggest impact on in the next five years? The idea of “making the impossible possible” through technology is best seen right now in industrial and real-world settings. While we were amazed (and are now obsessed) as a society with mobile personal computing via smartphones, we were only making what we have done for decades – personal computing – easier. In just the last year I’ve learned about practical work happening right now to put chips, sensors, and screens everywhere. This goes from giant things that don’t move (factories, power plants, and even trees) to sending in cheap, lightweight drones as ultra-mobile sensors. We have not begun to imagine the quantity of data we can gather and then correlate about the world around us and the things we use to support civilization. For example, sensors in LED lightbulbs can now include temperature; these are being installed in office buildings by the truckload, and can communicate via wifi. Recent software innovations to connect this data together with HRM (human resource management) systems shows that a few degrees difference in office temperature makes a 10% or greater difference in productivity, and that even a modern HVAC system produces an office with wide ranges in temperature even on a single floor. Gathering, processing, and applying vast quantities of newly available industrial data will have a transformative effect on how we work. The key enabler is the cloud: there’s no other way that we can make all of this economically possible. 7. By the year 2020, what do you hope Teradici has accomplished? I would like to see the PCoIP protocol as the basis of hundreds of millions of people’s daily experiences. There is a rapidly growing need to make data accessible and actionable by humans, and we are a vision-centric species. Screens that show us visualization of data, enable us to play with that data, and then take action are the order of the day. There’s a problem, though: the more capability we put into a device, the more it demands in both power and in programming time. I see a growing chasm between the demand for human-centric industrial computing and our ability to install and program the devices we need. PCoIP can be the infrastructure that spans the chasm. It can enable “smart screens” that have minimal footprint and enable all the power and programming to be done in the cloud. It can transform the economics of solving these problems and make hard things easy. We just have to keep our imagination open and work hard to achieve that future.